David Paitson transitioned to the Blue Jackets organization and spent 10 years with the organization as V.P. Marketing and later V.P. Ticket Sales. He also took on the dual role as President of the Arena Football League Columbus Destroyers during his final two years in the V.P. Marketing role. Today David works in intercollegiate athletics as Associate Athletic Director at Sam Houston State University. Alan Karpick moved back to West Lafayette, Indiana and became the successful Publisher of Gold & Black Illustrated, an independent publication promoting Purdue University Athletics. Brent Mauer moved onto the lead communications role in the American Hockey League before returning to Columbus to work in Indy Car racing for Team Rahal. As her publicists, he introduced Danica Patrick to the racing world before her eventual move to Andretti-Green Racing. Brent would later work in an elevated communications capacity for Ford Racing. Larry Lane was among the group that launched the Jacksonville Lizard Kings as the team’s General Manager. He stayed in Jacksonville working with the PGA, Information & Display Systems and later the Wasserman Media Group. Today he is Vice President of Corporate Relations for The V Foundation – the Jimmy Valvano Foundation endorsed by ESPN. Greg Kirstein would become the lead legal counsel for the Blue Jackets where he remains today. He continues his contributions to hockey in Columbus including the launch of the Dublin High School hockey programs and working with the various youth organizations. 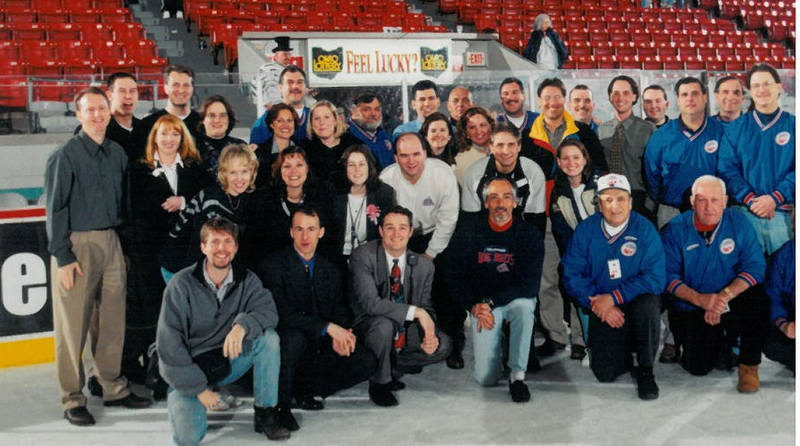 Gary Kohn helped launch the Columbus Blue Jackets as a public relations assistant and later returned to Rockford, Illinois where he was the public relations director for the Professional Women’s Bowlers Association. Today he is the marketing and communications director for Keith Country Day School in Rockford. Jim Talamonti took his broadcasting skills to two more minor league hockey teams before moving back to his hometown of Chicago where he initially worked for Sporting News Radio and WLS Radio. Today he’s with Westwood One and can be heard daily on WIND-AM. Ken Cohn worked with several sports agencies including as V.P. of Millsport, a sports marketing company specializing in high level clients and their association and retail execution with major league sports. Ken also worked for NASCAR overseeing a number of high profile corporate partnerships and today is the Senior Vice President for Cagnazzi Racing. David Peck also was part of the Jacksonville Lizard Kings launch, later joined the NFL Jacksonville Jaguars in their corporate sales department. He moved out of sports to take a job with Frito Lay and then PepsiCo as area sales manager. Ted Van Zelst spent seven seasons with the NHL New York Islanders before a role as Director of Corporate Marketing for NASCAR where he was responsible for soliciting all new corporate partnerships with NASCAR. Ted is now Vice President, National Property Sales at Live Nation. Anthony King became Director of Finance at the East Coast Hockey League. After testing off the charts on his LSATs he completed law school at Boston College. Anthony became a New York attorney for Kassowitz, Benson, Torres & Friedman in midtown Manhattan. Brian Sells moved from the Chill to become the Director of Corporate Sales & Marketing for the NFL Cincinnati Bengals. Mike Slates stayed in hockey working for the Tampa Bay Lightning and later the NBA Cleveland Cavaliers before becoming the Director of Corporate Sales for the NFL Minnesota Vikings. Sheryl Kolb would leave the Chill after the first season to help launch Horn Chen’s Central Hockey League. She later moved to Texas with her husband Eric who worked for briefly for MLBs Texas Rangers. Jakki Moyer worked in marketing for Ohio State University athletics and later with Worthington Parks & Recreation and private business. Jason Rothwell became the Director of Communications for the East Coast Hockey League. He then joined the Columbus Blue Jackets as assistant director of communications and later the head of creative services for the Blue Jackets. Amy Reese served briefly as the Director of Advertising and Promotion for the Buffalo Sabres before returning to Columbus to work on behalf of various marketing agencies and clients. Today she is the regional marketing manager for Stanley Steemer. Nora Ludwig joined the Blue Jackets just after the conclusion of the Chill. She remains there today working in finance. Evonne Segall became the regional marketing director for Fiesta Hair Salons. Chris Mizer continued to work as a trainer with various American Hockey League teams before joining the Blue Jackets as their first head trainer. He remained with the Blue Jackets for eight seasons. He is now a director at the Ohio State University Medical Center. Brian Farr, who followed Mizer as the Chill’s trainer during the Brian McCutcheon era, moved onto college athletics where he served as head basketball trainer and assistant football trainer at Oklahoma State University and the University of Texas. Today is the Director of Athletic Training Education Program at the University of Texas, having initiated and launched the program that teaches the athletic trainers in the Texas University systems. Jason Strouf, the Chill’s third and final trainer joined his family business in Billings, Montana. “Downtown” Billy Brown became the equipment manager for the Ohio State University women’s hockey team. Rusty Pearl, our head equipment manager, spent several seasons as an equipment manager for the Philadelphia Flyers. Jason Stipinski was another of the Jacksonville group and would serve as head trainer. He spent several years in minor league hockey before returning to Columbus as an equipment manager with the Blue Jackets. Joe Trotta became video coordinator for the Anaheim Ducks. Aylish Costello, another of the Jacksonville contingent, continued in ticketing and event management eventually returning to Columbus to work for Nationwide Arena and the Blue Jackets. Today she is Director for the Schottenstein Center the home of Ohio State University men’s basketball. Andy Heron continued to showcase his game presentation talents at Live Technologies and today is the Facility Manager and Technical Director at McConnell Arts Center of Worthington, Ohio. Susie (Churchill) Karya, who later worked with the Indianapolis Ice and spent ten years with McGraw Hill Publishing. Paul “the world’s most dangerous band” Shaffer led ticket sales for the Wilkes-Barre Scranton Penguins and later returned to Columbus and works in the private sector. Greg Bartram, the Chill’s official photographer and historian, continued in a similar capacity for the Blue Jackets and the Columbus Crew. He owns his own company – Better Image Photography and once in a while is known to pick up his guitar and get back on stage. Andy Davis a.k.a. Andyman the Program Director and afternoon deejay on CD 101 Columbus’s alternative rock station, served again as part time public address announcer for the Arena Football League Columbus Destroyers. Andy tragically passed away in 2010 in a drowning accident while on vacation. Neil Shaprio, the original Chill PA man, continued to work as public address announcer of the MLS Columbus Crew. He continues his full time role in automobile sales. A number of the Chill’s minor officials transitioned to the Blue Jackets in one game day operations capacity or another including Dan Grassbaugh, Steve Haller, Don Gullata, Joe Mongolier, Ron Mongolier Doug Reed, Don Supelak, and Larry Wilson. Columbus hockey legend Richie Shephard continued his role in working with the game officials at the Blue Jackets. Other contributors included Scott Woods, who became communications director for the Central Hockey League and later the International Hockey League, Mike Citro, who worked in communications for several minor league hockey teams before joining the Florida Panthers as communications and publications coordinator and is now a communications specialist at the Newport Group, Josh Beachy, who became senior manager for store communications and supplier relations at the corporate office of Home Depot, Courtney Hilbert, manager of testing & analysis at The Limited, Pam (Gill) Ivaldi, is the head of business development for Ivaldi, LLC, Kristina Jameson, continues as figure skating professional after serving as a promotions director at several Columbus radio stations, Julie(Fry) Mauer married Brent where they raise a family in Hilliard, Andrea Navin worked in community development with the Mighty Ducks of Anaheim and is today a manager of education and development for Kiehl’s, Carol Parish became Director of Marketing for the University of Washington Athletics and is today a operations manager for the Principal Financial Group. John Patterson, continued working in minor league hockey and eventually Comcast-Spectacor representing the Philadelphia 76ers and Flyers. Today John is the Ticket Sales Director for the Albany Devils. Bruce “the javelin” Javitz is Vice President of Accounting for Mandalay Baseball Properties, Michael Loftus is a standup comedian and co-producer of the NBC sitcom Outsourced, Jeff Gage continues in comedy teaching improve to aspiring comedians. Bev Meade and Juanita Singer moved on to private business. Andrew Jahant is a sales manager for Qwest Communications. Rusty Ranney is today the President and CEO of Live Technologies. Craig Merz, the Columbus Dispatch beat writer for the Chill, was at The Dispatch from 1982-2007 and is now a freelance writer, working for the Associated Press, MLS.com, Buckeye Sports Bulletin and Columbus Monthly among others.